In 1990, roughly one in 15 babies on the planet was born via cesarean section surgery. In 2014, one in five babies was born via cesarean. The rates have increased dramatically over the past few decades in most regions, with the fastest growth taking place in North Africa and Latin America and the Caribbean. There is substantial variation within regions, with certain countries experiencing more rapid increases than others. Considering data and measurement limitations is important when interpreting trends. Currently, there is no standard, internationally-accepted classification system to measure and monitor cesarean rates, which presents challenges when attempting to make comparisons between locations or time periods. Despite this limitation, though, available data illustrate a clear upward trend in most parts of the world. The highest cesarean rates are mostly found in middle-income countries in Latin America and the Caribbean, North America, Europe, Australia and Southeast Asia, while the lowest rates are found in sub-Saharan Africa. 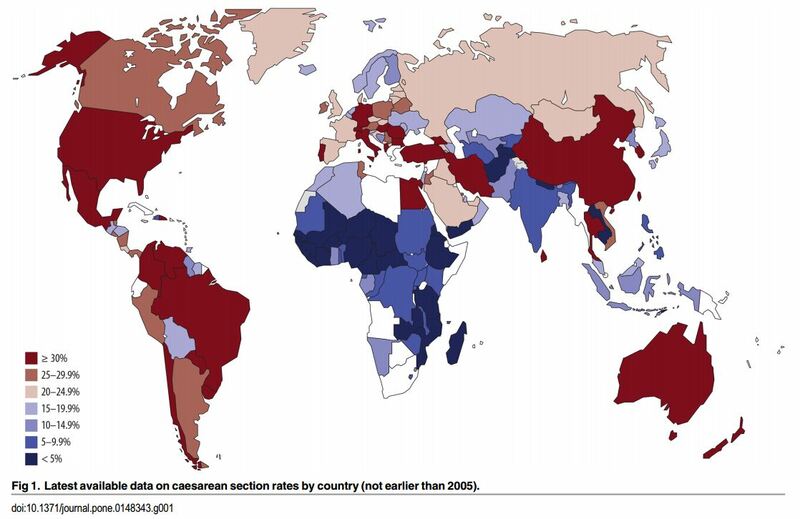 National cesarean section rates vary widely, ranging from less than 2% of births in Burkina Faso, Chad, Ethiopia, Madagascar, Niger and Timor-Leste—where many women do not have access to safe cesareans when they need them—to greater than 40% in Brazil, Colombia, Dominican Republic, Egypt, Iran, Maldives, Mexico and Turkey. There is also wide variation within countries depending on location. For example, in the United States, facility-level cesarean rates ranged from 7.1% to 69.9% in 2009. Similarly, cesarean rates in China ranged from 4% to 62.5% in 2014 across provinces. Graphs and adapted tables from Betrán et al. 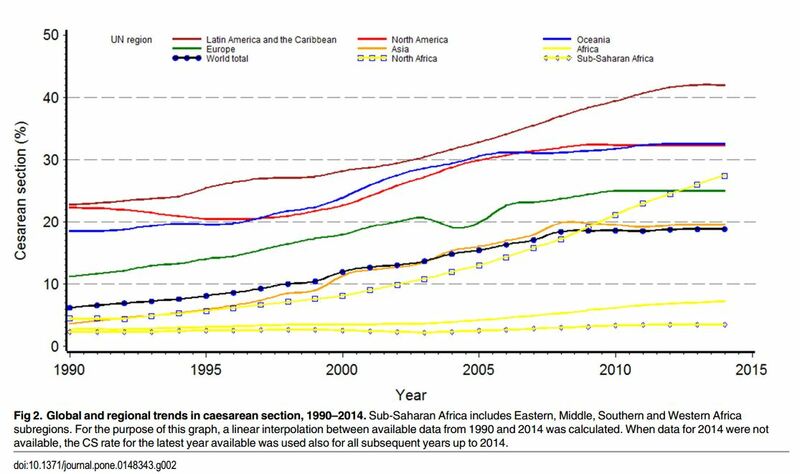 The increasing trend in caesarean section rates: Global, regional and national estimates: 1990-2014. PLOS One 2016; 11 (2): e0148343.